The University of Detroit Mercy School of Dentistry, in the Jesuit and Mercy tradition, through the integration of scholarly activity, evidence-based teaching,and service, fosters a forward thinking, inclusive learning environment committed to developing competent, socially and ethically sensitive healthcare professionals who are committed to patient care and community wellness. The University of Detroit Mercy School of Dentistry will be a leader in advancing health in a diverse and global society. The faculty and staff of the School of Dentistry have identified five core values as intrinsic to our academic community. These values are evidenced in our daily activities and guide planning for the future. Excellence: We value and reward excellence. Service: We are committed to serving our community, students, colleagues, institution, and the profession of dentistry. Respect: We promote respect of self and others and value diversity. Life-long Learning: We value life-long learning and promote development to achieve our potential. Integrity: We embrace integrity in all our daily activities and consider it essential to our identity. 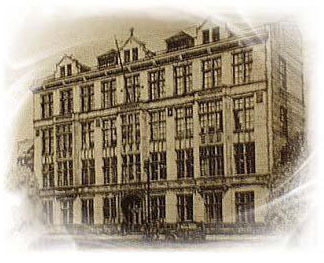 The School of Dentistry was founded in 1932, graduating its first class of students in 1935. It was originally located in the path of what became the Chrysler Freeway and moved in 1963 to East Jefferson Avenue, one mile east of the core of Detroit. In 1997, the School relocated into a new teaching and patient care facility on the University of Detroit Mercy's Outer Drive Campus. In January 2008, the School relocated to the Corktown Campus. The new facility is comprised of two, four-story buildings, containing 190 clinical operatories, state-of-the-art classrooms, and a simulation laboratory with a seating capacity of 100. The dental hygiene program was initiated in 1950, the postdoctoral endodontic program in 1959, and the postdoctoral orthodontic program in 1963. In 2004, advanced education programs in general dentistry and periodontics were initiated. In 1981, a 42-chair clinic was opened in the University Health Center at Detroit Receiving Hospital in the Detroit Medical Center complex. This hospital-based clinic, the largest of any dental school in the United States, provides fourth-year students with the opportunity to care for medically-compromised patients, and offers a rich learning experience which is unique in American dental education. The University of Detroit Mercy School of Dentistry’s programs in dental hygiene, predoctoral dental education and advanced specialty education (Advanced Education in General Dentistry, Endodontics, Orthodontics and Dentofacial Orthopedics, and Periodontics) are fully accredited by the America Dental Association’s Commission on Dental Accreditation (CODA). The University of Detroit Mercy is fully accredited by the Higher Learning Commission of the North Central Association of Colleges and Schools.